A pyramidal silk teabag of spiced black tea. 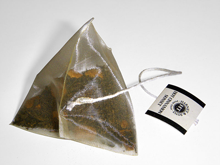 Pyramidal teabags are a relatively recent innovation. For aficionados, pyramidal bags, which allow more space for larger leaf fragments to steep, have begun to displace the conventional folded, stapled paper teabags, which still dominate the general market. The function of teabags is to contain the tea plant fragments, while permitting tea microparticles and water to pass freely during the brewing process. Containment facilitates removing the tea leaves at the end of the brewing process. One form of failure for a teabag is release of tealeaf matter into the pot or cup. This is the teabag equivalent of something "falling through the cracks." By analogy with the purpose of teabags, we don't want to stop absolutely everything from falling through the cracks. We don't want to catch and hold every ball. We must be selective. The process described here is one which, if adopted, could lead to indiscriminate acceptance of every responsibility that comes our way, and that could lead to dysfunction even more serious than the problem this process is supposed to address. Some "balls," though tossed in our direction, aren't properly ours to catch. Maintaining (or, if necessary, strengthening) our choice-making skills can be important as we enhance our ability to avoid dropping the ball. Photo by Shaddack, courtesy Wikipedia. Has anything ever "fallen through the cracks?" Have you ever "dropped the ball?" Have you ever had a great idea, then lost it, only to remember it later when you would have benefited from it? If this is a familiar pattern, would you like to do something about it? Here's an approach that might reduce the incidence of these misfortunes. How often do you actually fail to do something important? How much damage is there? Maybe you remember some horrendous incidents, and you're convinced that there's a problem. But for some, the extent and the consequences of the problem are unclear. To answer these questions, track these incidents over time, possibly weeks or months. One sure sign of a problem: you start tracking and drop the ball on tracking. Continually dropping the ball or letting things fall through the cracks isn't a path to success. If the data prove that there's a problem, then there's a problem. Fixing the problem begins with acknowledging the problem. The responsibility for repeated incidents of forgetting important issues lies with one person: the forgetter. Overload can be a cause, but if it is, then the person who's overloaded is the person most responsible for addressing the overload. Either way, the problem is the forgetter's and it's the forgetter's to address. a path to successthe other does (or stops doing) other things. Contracts describe everything from deals between partners to treaties between nations. Contracts can also help us make difficult personal changes. To make this kind of contract, tell someone else about it. Make yourself accountable to someone. If you have no one you can tell, write it down. Make a plan for this change for one category of item that you repeatedly drop. A To Do list usually isn't enough. Most likely you'll need to actually schedule tasks to make them happen. Some trial-and-error might be necessary. Do whatever works for you. This is your chance to practice. Find another category of item that you repeatedly drop. Deal with that category. Do the same techniques work for this category? Or did you have to invent some new approach? For items in this category, maybe you have to break them into smaller more doable parts. Or maybe you have to learn how to ask for help. Expand your tool kit. Soon you'll become an expert at not dropping the ball. Would you like to see your comments posted here? rbrenvTJtyIKOhEGBhGkOner@ChacwFWXUafSgirmESUPoCanyon.comSend me your comments by email, or by Web form. See also Personal, Team, and Organizational Effectiveness and Organizational Change for more related articles. I offer email and telephone coaching at both corporate and individual rates. Contact Rick for details at rbrenCFHjGcUyYYNowMgVner@ChacsjRjAQplhUxUQrvroCanyon.com or (650) 787-6475, or toll-free in the continental US at (866) 378-5470.